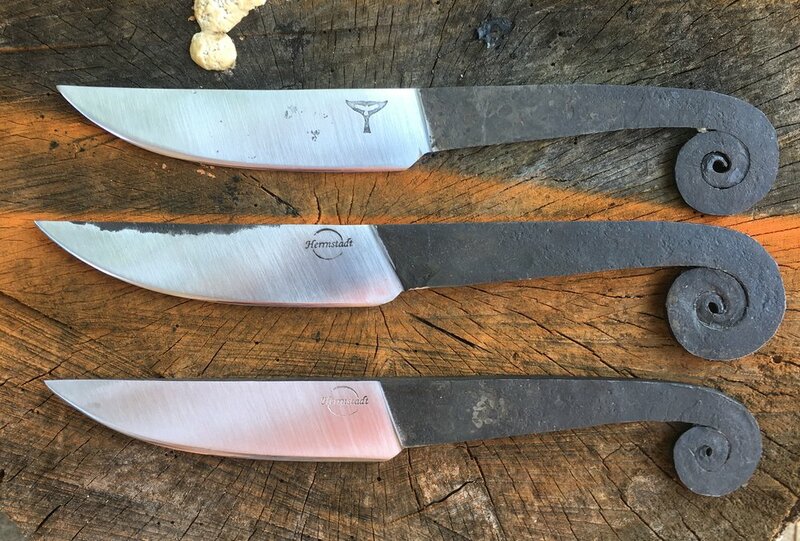 Here are some stills of one of my Master Smith teachers, Brion Tomberlin during his American Bladesmith Society (ABS) Intro to Bladesmithing Class demonstrating initial forging steps to make a chopper to be used in a Journeyman performance test. These are just a microscopically small part the ABS intro class I took August 2017 at the New England School of Metalwork (NESM) in Auburn, Maine. Thanks also to Nick Rossi JS who was assisting Brion and taught me as well. Both Brion’s and Nick’s websites are in my Links of Interest. I will add some slow motion videos in the near future. Lately I’ve been thinking a lot about something that happened about 2 years ago in one of my classes. I teach industrial design to 19-23 year old students and also graduate student who are usually mid 20’s to 30’s and older. While helping an undergrad with some computer prototyping, I resaved her file by adding my three initials to the beginning of her file name in order for her to more easily differentiate between her original and my suggestions. “Say what?” I countered. I literally had not made a sound. ”Shaking my head.” She explained. All I could think of was that it really explained a lot about my life. I recently came across a 2001 Iowa State Daily article about a former student of mine Rachel Hein who was an environmentalist and had taken part in a 220 person protest in front of Menards. The link is at the end of this post. It applies even more given the new assault on our public lands and our planet as a whole. "Steven Herrnstadt, associate professor of art and design who taught Hein in some classes, said he is pleased to have a student who is not learning to "fit the proper cubicle. ""Everything we learn and teach here is not without the context of greater experience," Herrnstadt said. "Everything has an interconnection to … a ripple effect on everything else. "Herrnstadt said universities need to have a social obligation to explain these concepts to students. "The workings of our society and the world are not understood well enough by us to cast aside what the environmentalists and humanists have to say as merely 'tree hugging' nonsense," he said. STEM and Business/entrepreneurship need to be taught in context of the humanities, ethics and the arts. Otherwise advancement and innovation becomes about short term profit an solutions only. It will lack the vision of historical events which should serve to illustrate benefits/detriments. Parsing our knowledge into the smaller departments/subjects that current education finds comfortable but not bringing them into the greater gestalt invariable means that pieces are left behind. The mere sum of the parts is rarely perhaps never equal to the whole. All subjects need to be emphasized in our educational systems, particularly at the levels of higher education. BUT more than that, universities must emphasize Collaboration. And it must be collaboration without ego's. I have been going to and enjoying the visual, aural, and scent solitude of these lands for over 50 years. I shared that with my children. I want to share it with my grandchildren. Fracking, drilling, etc. will destroy the last vestiges of my rights to enjoy the lands set aside for the public to enjoy. It does not belong to the energy companies to destroy the solitude and beauty that we need for the physical and emotional health of this country. Not everyone loves living and spending time in the cities. Many of us cannot afford to take trips to exotic places that the CEOs can assuming they want to. These are the last places that the middle and lower classes can consider their refuge. I have already seen mountaintops where I used to hike and camp disappear. I have gone back to remote areas that were once silent and pristine to find distant noise and reduced visibility and no trespassing notices. I’m writing to urge you not to allow oil and gas companies to frack in our national forests and near our national parks. These are America’s best and most unique places and they should be kept safe for future generations. You can just imagine the impact on wildlife and rivers and streams if we allow the industry to bulldoze their way into publicly owned forests, inject tons of chemical-laden water into the land, fracture the rock deep beneath the surface, and truck out highly toxic wastewater, all while spewing diesel fumes and climate-changing methane into the air. Please declare our nation’s parks and forests safe from fracking. This is is the text from an email I received from Photographer and Environmentalist Bruce Barnbaum. He also happens to be a friend of mine. (NOTE: If the link doesn’t work directly, please copy and paste it into a web search. " I get asked that a lot. It is a title I took in about 1985 while teaching at Iowa State University. It has been in my ISU signature for about as long and on my business cards. The short answer is that it has to do with remembering our place within the interconnections and scheme of the world and is an excerpt from an essay I wrote about that time. Thank you for stopping and looking at my site while I am constructing it. I appreciate your patience and interest.